As soon as anyone finds any 2006 coins *in circulation* please post them here, and I will keep an up-to-date list. Last edited by Fjon on Mon Apr 06, 2009 2:59 pm, edited 65 times in total. If you can keep your head when all around you have lost theirs, then you probably haven't understood the seriousness of the situation. User Control Panel>Board preferences>Edit global settings>(1) Sélectionnez le thème "Subsilver2" pour avoir une apparence ressemblant à l'ancien forum (2) Forum en français désormais possible! It is still the same in France for the smallest coins (1c & 2c). We always replace them very early. Germany 2 Euro "Holstentor" "G"
teckenschnempo wrote: Germany 2 Euro "Holstentor" "G"
Greece 10 c. For us, it's Hellas, 10 lepta. I got it as change tonight at a metro station in Athens. It appears that the letter font for the year has somewhat changed. The numbers are obviously thinner. No other changes are visible. Yes, i got 2 coins yesterday as change in a media-markt in Wiesbaden. I was very happy about that, because I read in the german forum that these coins are not yet available in many banks. 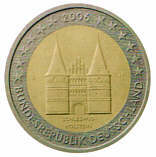 How many Holstentor coins are in circulation? Are it enought that everybody will anywhen a coin like this? or are it so unmany that it is only for collect-mans? PS: I have never get a coin that is younger then 2002! Are _holstentor_ already in circulation? 30 million coins will have been minted by the end of this year. I don't think more than 1 million coins are already in circulation. I don't know how precise you want your list to be, the coin that I got in Berlin was minted in Berlin also ('A') It still was quiete shiny btw and is now in my Euro mint collector map replacing the old normal German 2 € coin. Thanks - I've changed it! Will all 5 mints be making this coin?